Approximately 300,000 American children and teens live with juvenile arthritis – that’s about 1 in 250. Yes – you read that correctly: 1 in 250 kids suffers from arthritis. If that number isn’t eye-opening enough, check out this staggering statistic: there are only 250 active and board certified pediatric rheumatologists in the United States. Unfortunately, these specialists are mostly found clustered around large cities — and there are 11 states with no pediatric rheumatologists at all. While they may be better equipped to handle some of the nuances that come along with treating a younger patient population, a regular rheumatologist can treat a patient with juvenile arthritis. Treating Juvenile Arthritis is not the same as treating adult onset arthritis, so the adult rheumatologist will most likely coordinate with a pediatric rheumatologist in another area. If they currently aren’t during your treatment, don’t be afraid to ask them to and at least start the conversation! 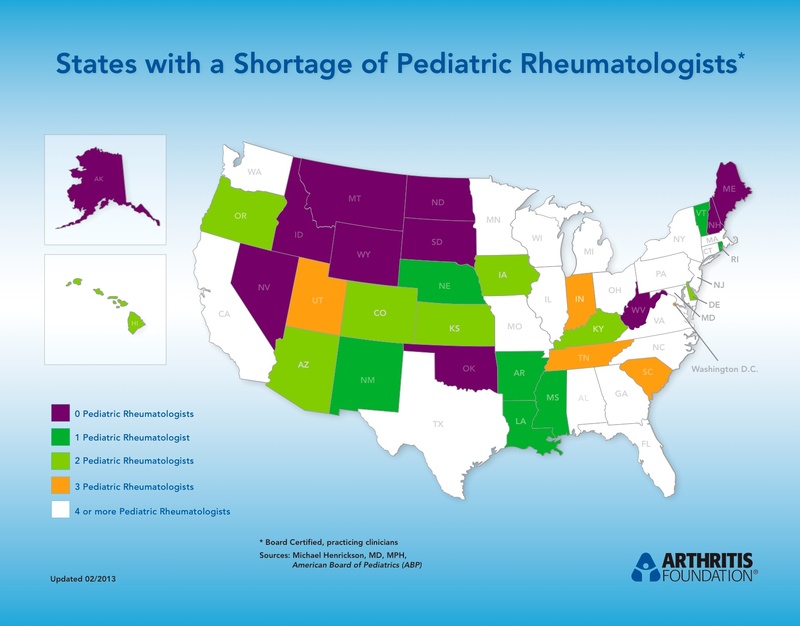 Below is a graphic showing a state-by-state breakdown of pediatric rheumatologists in America. View the full-size version, here. Tags: #facearthritis2013, Arthritis Foundation, arthritis statistics, CDC, childhood arthritis, JA, JIA, JRA, Juvenile Arthritis, juvenile idiopathic arthritis, juvenile rheumatoid arthritis, Kids Get Arthritis Too, pediatric rheumatologist, pediatric rheumatology, RA, Rheum, Rheumatoid Arthritis, rheumatologist, rheumatology. Bookmark the permalink.